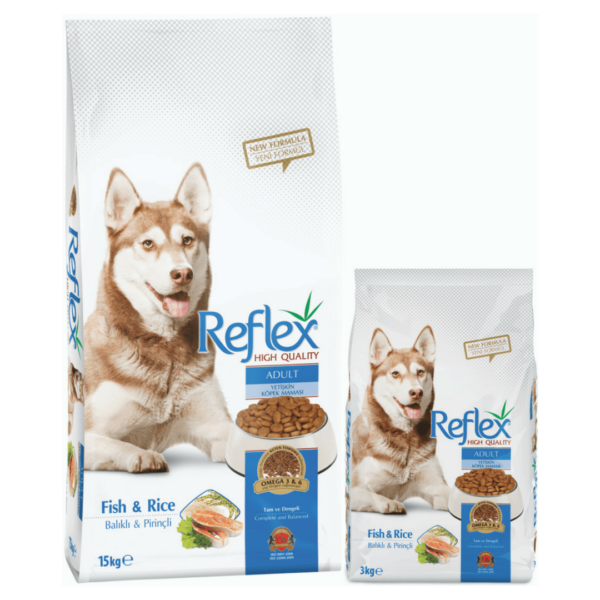 We are the only company that provide and supply Reflex dog food in Afghanistan. 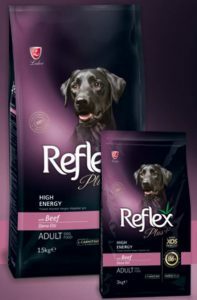 Reflex is a well-known Turkish dog food brand that provides both dry and wet dog foods for or different category of dogs in different types and compositions. Specifically formulated to meet high energy needs of hunting, working and active adult dogs from all breeds. Also suitable for pregnant and nursing mother dogs. 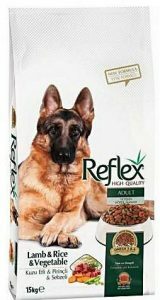 for active, pregnant and nursing adult dogs from all breeds. Beef Protein (dehydrated), Animal Proteins (dehydrated), Corn, Chicken Fat, Rice, Beet Pulp, Liver Flavour, Whey Powder, Vitamins and Minerals, Xylo-Oligosaccharides, Brewer’s Yeast, L-Carnitine, Linseed, Salt, Yucca Schidigera, Preservatives – Antioxidants. 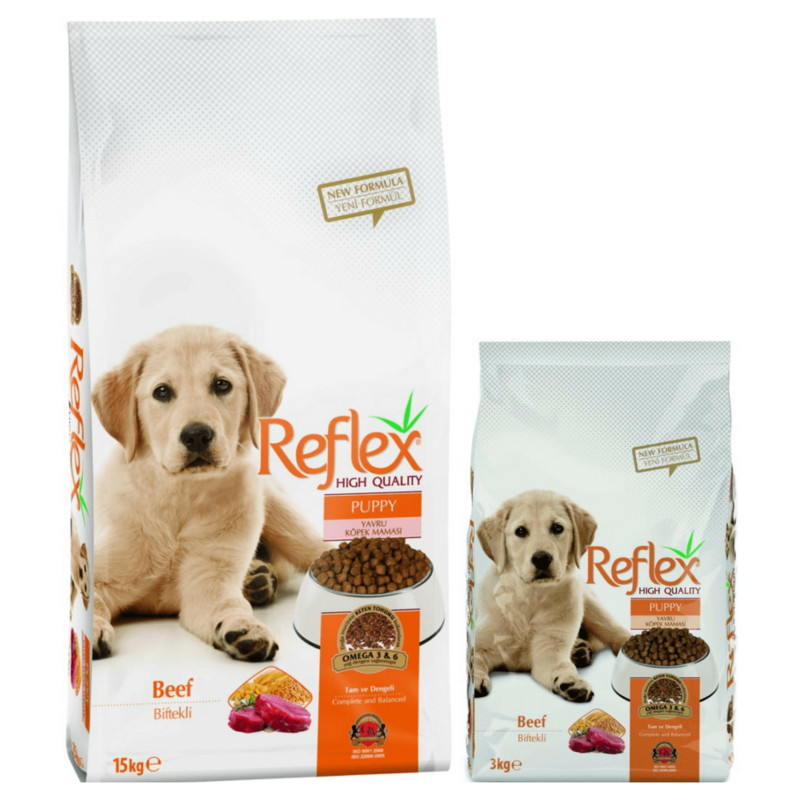 Reflex Lamb and Rice and Vegetable Adult Dog, an especially formulated complete and balanced premium dog food including lamb protein and vegetable to meet the nutritional requirements of adult dog breeds. Processed Animal Protein, Wheat, Corn, Animal Fat, Wheat Middlings, Corn Gluten, Rice, Dried Carrot, Dried Peas, Dried Sugar Beet, Liver Aroma, Dried Lamb Meat, Salt, Flaxseed, Dried Brewer’s Yeast. Vitamins: Vit. A, Vit. D, Vit. E, Vit. C, Vit. B1-B2-B3 (Niacin)-B6- B12-B7 (Biotin)-B9 (Folic Acid), Vit. K, Choline, Calcium Pantotetan. Reflex Beef Puppy, an especially formulated complete and balanced premium dog food including beef meat protein to meet the nutritional requirements of puppies for optimum growth. Ingredients: Processed Animal Protein, Wheat, Corn, Animal Fat, Wheat Middlings, Corn Gluten, Dried Sugar Beet, Liver Aroma, Salt, Flaxseed, Dried Brewer’s Yeast. Vitamins: Vit.A, Vit.D, Vit.E, Vit.C, Vit. B1-B2-B3 (Niacin) -B6-B12- B7 (Biotin) – B9 (Folic Acid), Vit. K, Choline, Calcium Pantotetan. 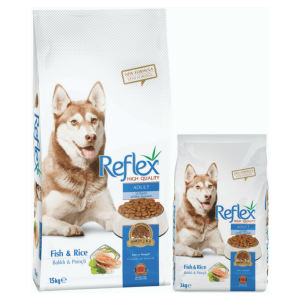 Reflex Fish and Rice Adult Dog, an especially formulated complete and balanced premium dog food including fish protein to meet the nutritional requirements of adult dog breeds. Processed Animal Protein, Wheat, Corn, Animal Fat, Fish Meal, Fish Oil, Wheat Middlings, Corn Gluten, Dried Sugar Beet, Liver Aroma, Fish Aroma, Rice, Salt, Flaxseed, Dried Brewer’s Yeast. Minerals:Calcium, Phosphorus, Sodium, Iodine, Zinc, Copper, Potassium Chloride, Iron, Selenium. Vitamins: Vit. A, Vit. D, Vit. E, Vit. C, Vit. B1 – B2 – B3 (Niasin) – B6 – B12 – B7 (Biotin) – B9 (Folik Asit), Vit. K, Kolin, Kalsiyum Pantotetan.